Instruction For Use: Use as a condiment for seafood. Allergy Advice: Contains Soybean, Wheat, Sesame, Peanut. 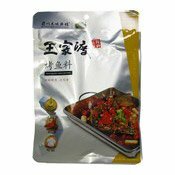 Ingredients: Soybean Oil, Chilli, Broad Bean Paste (Chilli, Broad Bean, Salt, Water, Wheat Flour), Fermented Soybean, Chilli Pepper, Ginger, Garlic, Sesame Oil, Peanut, Sesame, Salt, Cumin, Artificial Chicken Flavouring (0.5%), Yeast Extract, Flavour Enhancers (E621, E635). Simply enter your details below and we will send you an e-mail when “Roast Fish Condiment (王家渡烤魚料)” is back in stock!